With two weeks of the ten week Thursday Thunder Legends series presented by Papa John's Pizza in the books, drivers are searching for any type of advantage that could help propel them to Victory Lane. Six points separate the top two drivers in three divisions with a four point gap in the VP Racing Fuels Pro division while the Masters division is deadlocked at the top. Robbie Woodall of McDonough and Bill Plemons Jr of Locust Grove have fininsihed 1-2 in each of the first two races of the season and sit tied atop the Master's division point standings. "Robbie and I have a lot of respect for each other like a lot of the other racers," said Plemons. "Robbie is a tough competitor." Both drivers are searching for their first Thursday Thunder division championship. 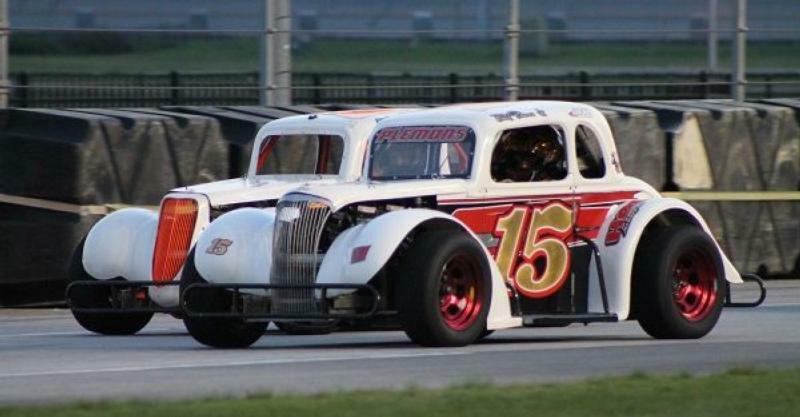 After a second place finish last year in the point standings in the Masters division, Woodall is off to the best season start of his career despite posting three wins, three top-fives and three third place finishes in last year's ten week season. Twice has Plemons finished third in the Masters Division point standings in 2011 and in 2015. Plemons' victory in week two evened the point standings as the pair has an 18 point advantage over third place Wes Potter. With two wily veterans at the top, the slimmest of margins will be the difference each night as the pair battles for division supremacy throughout the season. "All these cars have different combinations. We all run the same kind of motors, springs and shocks, but we can play around with these gears," explained Plemson after his week two victory. "So Robbie played around with some gears last week and so I played around with some this week, so the tables got turned." Expect the points battle to tighten up as the season progresses. Mark Swan, who currently sits in fourth, finished third in each of the past two seasons. "I'll be here next week to see what happens," said Plemons following last weeks' win. While the Masters division has produced the tightest points battle over the first two races, a full field of Semi-Pro competitors has also seen two different winners and six points separating the top three through two weeks of action. Sammy Smith of Johnstown, Iowa dominated week one action while Davis Rochester waited patiently before making his move in week 2 action to capture the win and move into the points lead. Despite not finding victory lane, DJ Canipe is tied for second with Smith in the Semi-Pro Division. Other tight races include a four point difference for the top spot in the VP Racing Fuels Pro Division between leader Jensen Jorgensen of Stockbridge and Rafe Slate of Eatonton. Ryan Rackley of Valdosta holds a six point lead on Social Circle's Lawson Ingold in The Associates Group Insurance Young Lions division. It is also a six point differential at the top of the Bandits division with McDonough's Kelly Pucket leading Ryan Younginer of Locust Grove while Kenny Brady of Marietta is six points up on Alto's Kenneth Henderson. The 2018 season continues with week 3 action this Thursday, June 14 and will run each Thursday night through July 26, before wrapping up with a special-edition Saturday Championship Night on Aug. 4.